JoeGeo is a professional promotion system designed to increase your sales and sign-ups as well as provide you with additional income streams. Joe Geo offers a very powerful set of options and possibilities, so no matter how big or small your promotion efforts are we can help you. Joe Geo is free to join and free to use so why not give it a go, we think you'll love it. If you have traffic from countries you just don't need then why not sell it to somebody that does need it. Our system allows you to sell your unwanted traffic to the highest bidders. 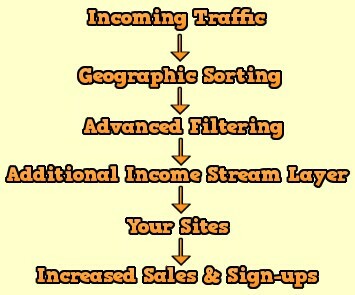 Want to buy high quality geo targeted traffic? then JoeGeo provides you with a campaign manager where you can buy web site traffic from as little as 10c per 1000 visitors. © 2013 - 2019 JoeGeo.com. All Rights Reserved.